Davies Signs was established on the success of our illuminated mobile signs. 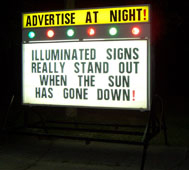 These signs provide an excellent form of advertising that uses lighting to attract public attention. 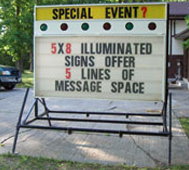 However, lighting your illuminated mobile sign is an option. Our illuminated signs come in two different sizes. Our 5’ x 8’ illuminated signs have a row of advertising on the top of the sign then a row of floodlights. Below this are four more lines of advertising. Our 6’ x 8’ illuminated signs have two rows of advertising on the top of the sign then a row of floodlights. Below this are four more lines of advertising. Both signs are double sided so that you can advertise the same message on both sides or different messages on each side of the sign. Each illuminated sign can be plugged into hydro to provide a lit background for the acrylic letters which make up your message. The bar of floodlights at the top also attracts attention to the sign. That’s why our illuminated signs are not only effective during the day, but also really stand out at night as well. On the illuminated sign the letters are black and the numbers and characters are red, and their height is 8”. When you rent a sign from Davies Signs you get superior service at respectable prices. Our illuminated signs come delivered with your own personal box of letters so you can change your message as often as you like. If you would prefer, we can put the message on for you. 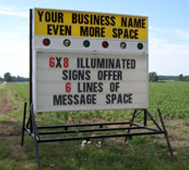 For Illuminated sign pricing give us a call!